From a peer with dyslexia to a cousin who uses a wheelchair, your child may be curious about people with disabilities. Talking to your child about disabilities can help him gain a better understanding of why some people look, talk, act, or move a little bit differently. Don’t try to convince your child that someone with a disability is just like he is. Instead, acknowledge that they are a little different, but make it clear that just because someone is different, that doesn’t make that person bad. Then, show your child how to talk about those differences in a respectful manner. Give your child the language to use to talk about someone who has a learning disability or a physical disability. Try to keep your emotions out of your conversation. If you say someone’s disability is “sad” or “awful,” your child may pity the person, and that won’t be helpful. Some people are born with disabilities. Make it clear that sometimes, babies are born with disabilities. But at other times, people develop disabilities later in life. People with disabilities aren’t sick. Explain that a child with cerebral palsy or muscular dystrophy isn’t sick. You don’t want your child to think he might catch a disability. There’s nothing wrong with people with disabilities. Your child may ask questions like, “What’s wrong with that girl?” Explain that a child may have trouble talking or difficulty walking but that doesn’t mean there’s something “wrong” with her. A physical disability doesn’t mean someone has a cognitive disability. Sometimes, kids assume someone with a physical disability may also struggle to communicate or may not be smart. Make it clear that just because someone’s body doesn’t work the same doesn’t mean their brain is impaired. Talk to your child about how people with disabilities may use adaptive equipment to assist them. Someone in the grocery store may have a service animal, and other people walk with crutches or use a wheelchair to get around. You may also explain why there are parking spaces for people with physical disabilities located near the store. Explain how someone may use a special vehicle, designed to fit a wheelchair with a ramp or lift. Educate your child how to best assist someone who uses adaptive equipment. For example, make it clear that your child should never pet a dog who is wearing a service vest unless the owner invites him to do so, and explain how holding a door for someone who uses a wheelchair may make it easier for them. 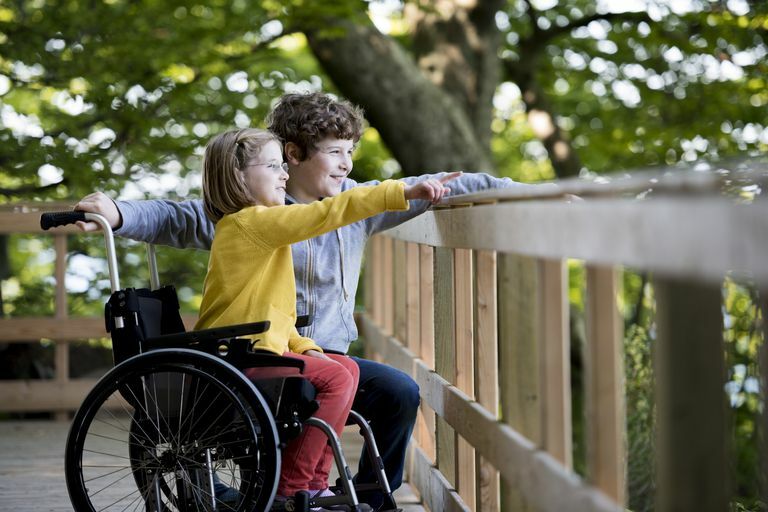 Understanding how they’re the same can help your child relate better to people with disabilities, and it can help increase your child’s empathy. There’s a good chance you won’t have all the answers about someone’s disability. Researching a disability together can help you show your child how to educate himself on unfamiliar conditions. Look for kid-friendly websites that offer information about autism, down syndrome, learning disabilities, or other disabilities that he may have questions about. Then, go through the information together. Read age-appropriate books about disabilities too, and look for TV shows that address specific conditions. Sesame Street, for example, depicts a muppet named Julia who has autism. Your child may have some tough questions about someone’s disability. Don’t be afraid to say, “I don’t know,” if you don’t have the answer. Or, try saying, “I’ll have to think about that and get back to you,” if you need some time to gather your thoughts before giving an answer. Why was he born like that? You could give a science-based answer by saying, “When he was growing in his mother’s belly, his foot just didn’t grow.” Or, you might give a spiritual answer that reflects your beliefs. Unfortunately, there’s a good chance your child will overhear some unkind words used to describe someone’s disability, and there’s a chance your child will repeat those names. Address unkind words right away. Explain to your child that such words are hurtful and it’s not OK to say them. If your child continues to use those words after you’ve explained to him that they’re inappropriate, give a negative consequence. Make it clear that putting people down and speaking disrespectfully about others won’t be tolerated. Additionally, don’t allow your child to engage in mean-spirited behavior. Make it known that imitating people with a disability isn’t kind and tell your child not to laugh at others. Make sure you’re a good role model. If you use outdated language or inappropriate words to describe people with disabilities, your child will follow suit. Kids often want to be helpers but, they may not know how to do something that is actually helpful. Or, they may put themselves in danger. Getting behind someone in a wheelchair without asking them if they need assistance could be dangerous if the person using the wheelchair doesn’t see your child. Similarly, your child may be tempted to intervene if he sees a child with autism who is feeling very upset. But, the child just may need a little space to calm down and giving him a hug could make it worse. So teach your child to ask before springing into action. Asking, “Is there anything I can do to help?” gives the other person an opportunity to say whether assistance would be appreciated. If your child grows up with a loved one who has a disability—like a cousin or a grandparent—he may raise new questions over time. As he gains a better understanding of the body, he may have bigger questions. If it’s a close friend or family member who has the disability, ask if the individual is willing to answer your child’s questions. You may find your loved one is happy to field questions to give your child a better understanding. You may also want to contact your child’s teacher. While the teacher can’t reveal information to you about another student, it might be helpful for the teacher to know your child has questions, and other children likely have questions too. Many schools offer disability-awareness programs. Find out if your child’s school has any type of curriculum that teaches kids about disabilities. When children understand another child’s disability, they’re more likely to become an ally. Encourage your child to include peers with disabilities in activities. Eating lunch at the same table, playing at recess, or simply striking up a conversation are a few ways your child can be inclusive. If you have a disability, your child may have a lot of questions about whether you’re going to get better or why you can’t do certain things. It’s important to give honest answers in a kid-friendly manner. It can be confusing for kids if a parent has a disability that isn’t visible on the outside. Kids can’t see what’s wrong when a parent has an issue that involves chronic pain, for example, so it’s important to give kids a little information about the science behind what’s happening to your body. It can also be helpful to share about your self-care strategies. Whether you attend physical therapy, get acupuncture, or take medication, make it clear to your child that you are taking steps to take care of yourself. If you have a new disability—like the loss of a limb from an accident—and your child is struggling to adjust, seek professional help. Talking to a psychotherapist could help your child process her feelings and adjust to the changes. Bassett-Gunter R, Ruscitti R, Latimer-Cheung A, Fraser-Thomas J. Targeted physical activity messages for parents of children with disabilities: A qualitative investigation of parents informational needs and preferences. Research in Developmental Disabilities. 2017;64:37-46. Clapham K, Manning C, Williams K, O’Brien G, Sutherland M. Using a logic model to evaluate the Kids Together early education inclusion program for children with disabilities and additional needs. Evaluation and Program Planning. 2017;61:96-105. Underwood K, Valeo A, Wood R. Understanding Inclusive Early Childhood Education: A Capability Approach. Contemporary Issues in Early Childhood. 2012;13(4):290-299.